Marion Ross by Cushman, as curated by the Champaign County Historical Society. 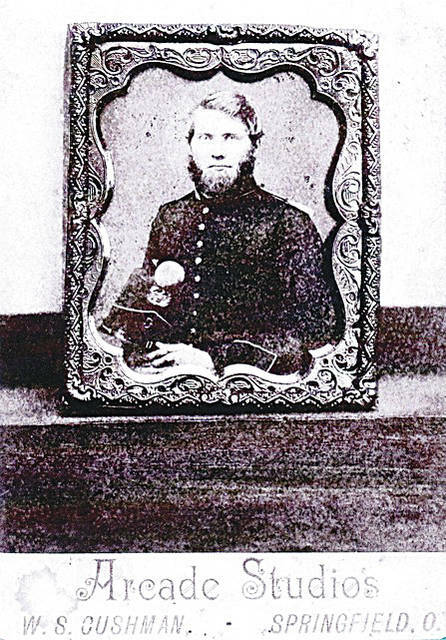 The Champaign County Historical Society will present a program about Christiansburg native Marion Ross, who won the Medal of Honor for his participation in the “Great Locomotive Chase” during the Civil War. The program will begin at 2 p.m. on Sunday, April 14, in the Historical Society museum. Ross’ Medal of Honor will be on display. Paul Sullenberger, a Christiansburg native, will give the presentation. He graduated from Graham in 1971 and served in the U.S. Navy before working for the Piqua Police Department for 21 years. Following the program, Disney’s 1956 film “The Great Locomotive Chase” starring Fess Parker will be shown. The program is free to the public, and the museum will be open. The Champaign County Historical Society is an all-volunteer, not-for-profit organization that preserves, protects, archives and displays the artifacts that tell the Champaign County story. The society depends upon donations and dues to provide a free public museum located at 809 East Lawn Ave., Urbana. The museum is open 10 a.m.-4 p.m. Mondays and Tuesdays. https://www.urbanacitizen.com/wp-content/uploads/sites/36/2019/04/web1_Marion-Ross-by-Cushman.jpgMarion Ross by Cushman, as curated by the Champaign County Historical Society.